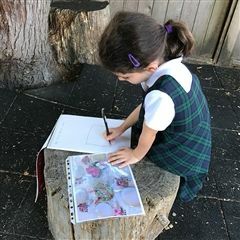 Learning in the garden. Making new friends. Exploring and discovering. 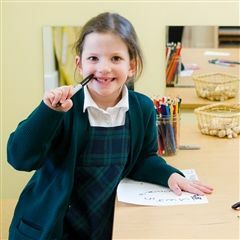 The Little School offers a nurturing learning environment for our youngest Yorkies. The classrooms are open spaces where the girls can learn, explore, and play. Outside, the girls tend the garden, play on the jungle gym, or do project work on the patio. York House has had a kindergarten program for over 30 years. 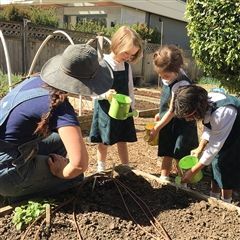 Since 1994, we’ve offered a full-day program and since 2008, kindergarten classes have been held at the "Little School", just minutes away from our main campus. 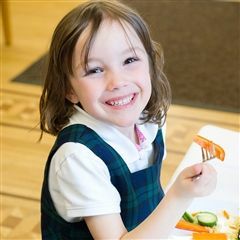 Junior Kindergarten (JK) is for four-year-olds and Senior Kindergarten (SK) is for five-year-olds. Each class has two teachers. The Little School emphasizes the importance of play for young children in their early years. Play allows the girls to develop self-regulation and cooperation skills. It also helps them develop complex language and vocabulary, problem solve, and think flexibly. Through play, they can make scientific, mathematical, and social discoveries. We know that children who play, work in groups, and form social relationships will be more successful in their later years. 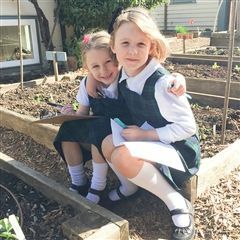 The garden is the heart of the Little School. 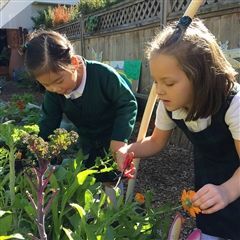 Our students and teachers work together to plant, grow, and harvest vegetables, herbs, fruits, and flowers. They use what they grow to cook, incorporating many lessons about Mathematics, Science, and Reading, and Writing. The garden is also a place of wonder. 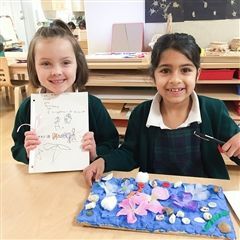 Provocations, such as, “What do fairies need to live in our garden?” motivate our students to use creative and critical thinking, communication, and art to generate theories and develop stories that lead to building structures like fairy doors and houses. 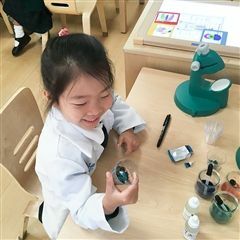 Field trips (or field studies) are essential to the Reggio Emilia approach as it encourages students to explore, ask questions, and see things in their natural environment. Field trips are used to enhance project work. On a trip to UBC Farm, students learn about where our food comes from, the role of farms in our food system, and basic soil science. They make connections between our BC forest ecosystem and farms, naming native plants and learning of their medicinal and edible properties. Teachers use games, songs, and hands-on activities to help the children develop an understanding of the French language. The introduction of French using the Accelerative Integrated Method (AIM) allows children to become acquainted with French at an early age. Former YHS teacher Wendy Maxwell founded the AIM method while teaching at the Junior School. The method is now recognized around the world. Learn more about AIM here. The girls are exposed to music every day through songs, clapping games, and dancing. A more formal music time is held twice week, using an Orff approach. The Orff Method is a way of teaching children about music that engages their mind and body through a mixture of singing, dancing, acting, and the use of percussion instruments (i.e. xylophones, metallophones, glockenspiels). The Junior School P.E. teacher comes to teach a gym class to the girls every other day. We focus on balancing, travelling in different ways, listening games and routines. The Little School PE specialist teaches our JK and SK girls a program developed especially for our youngest students three times per week. Since 1994, every kindergarten class at York House has been taught to play chess. Chess is taught as part of the math curriculum. It is an excellent way to develop concentration and extend thinking skills. The method used is the English Lincolnshire system of teaching chess. The game is first played with pawns only before introducing other chess pieces. This method has proven to be a highly successful way of introducing chess to young children. The Artist in Residence program brings in an artist to work on a special project with York House students and teachers, such as drawing comics, dance or sculpture. The “expert” spends four to six weeks at the school demonstrating different types of media and technique. While she was a Queen’s University Fine Arts student, York House alumna and current YHS Gr. 2 Teacher, Casey Wilson-Gay ('08), was the Little School’s first Artist in Residence. She helped the girls build “treasure stones” for the garden. The stones represent the first senior kindergarten class at the Little School. The kindergarten classes make frequent trips to the main YHS campus. This helps them orient themselves to the Junior School, where they will eventually enter Grade 1. At the Junior School, the girls have a chance to play on the two playgrounds, or spend recess in the sand and rock digging area. Sometimes they visit with Mrs. Sobieski, the Junior School counsellor, or they have library time with the Junior School librarian. In the Learning Commons (library), the girls learn where to find fiction and nonfiction books and each girl is able to take out a book to bring back to the Little School. The girls also have Grade 3 reading buddies. The SK girls read short books to their buddies, and in the turn, the buddies read to the girls. At the beginning of each class, parents are encouraged to stay for 15 minutes to complete one activity a day with their child. At York House, students are seen as very capable beings. This is why at the Little School, our teachers base their methods on the Reggio Emilia approach to early childhood education. Reggio Emilia recognizes that in the early years of development, children are just beginning to form who they are as individuals. Children learn best through interacting with others, including their parents, teachers, and peers, in a nurturing learning environment. With this method, the children’s interests determine the curriculum. The girls work on in-depth projects, and the teachers learn alongside the children, documenting the learning process. 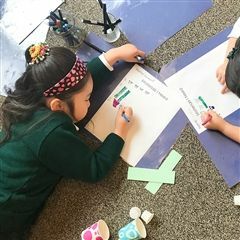 The Reggio Emilia approach is used to determine the curriculum in the Junior Kindergarten classes. The Senior Kindergarten curriculum integrates the Reggio Emilia approach with BC prescribed learning methods.